While Saving Over 75% off the Regular Price. Save over 75% and get THREE bodyweight-only workouts, including the first ever “Bodyweight Cardio Gauntlet Circuit”, the “Fat Burning Fight Circuit” and the original “Crazy 8 Bodyweight 300 Circuit”, while ALSO getting to ask Craig any fat loss question you want in the TT Member’s Area. You are lucky. You see, you have the innate ability to burn extreme amounts of fat while getting ripped at the same time using only one free piece of equipment  your bodyweight. The problem you may have, however, is in understanding exactly how to maximize the use of this ‘equipment’. Sure, you could mix and match a few bodyweight exercises, but without a proven formula, you’re unlikely to burn fat and build muscle at the SAME time. Now let’s look at this from a different angle…. Imagine that you actually did have a ‘bodyweight-only guide’ to follow. Just think how useful that would be on days where you “don’t have time” to workout at the gym. Instead, with your proven zero-equipment workout in hand, you simply head home, change into your gym clothes and crank out a quick and powerful workout. So now, rather than missing a workout and later feeling guilty about it, you manage to squeeze in a powerful workout that moves you closer to your goals. Let’s be honest, we’ve all had an excuse for missing a workout or two, but I’m determined to help eliminate those excuses so you can look and feel the way you desire. Have you ever missed a workout or had to jumble a bunch of random exercises together because your hotel’s tiny gym was outdated and underequipped? Being that I travel so much, it happens to me all the time. In fact, just earlier this year I was stuck in a hotel room with the only option being a cramped hotel gym equipped with 20-pound dumbbells - and I wasn’t about to waste my time doing long boring cardio. The no-BS truth, however, is that hotel gyms are not the only reason for a missed workout or two. Lack of time, busy gyms, no gym membership  these are all reasons, excuses for why your body doesn’t look the way you know it’s capable of looking. The good news is it’s often when I’m stuck in those “fancy” hotels with shockingly bad gyms that I get inspired to create awesome bodyweight workout programs like Turbulence Training Bodyweight Cardio 5. With three tough workouts geared for maximum fat loss and conditioning, including TWO five rounds of five-exercise circuits (one being the first ever Bodyweight Cardio Gauntlet workout), plus an updated Bodyweight Cardio 500 challenge, I guarantee your body will undergo a radical transformation - and all without boring cardio. You’ll also feel liberated after ditching the equipment and using unique, bodyweight-only exercises that you can do anywhere. That’s why the bodyweight cardio program series remains so popular year after year. Take them on the road while traveling, to the beach for a fat burning workout by the water, or simply do them in the comfort of your own home. You choose. Let’s face it… our days are busy and unpredictable. That’s why you need a workout program that is not only flexible enough to let you decide when and where to workout, but one that is also guaranteed to get your body into hyper fat-burning mode. It’s time we put an end to the slow cardio propaganda. There is a better way, and it’s called Turbulence Training Bodyweight Cardio 5. Work, kids, appointments, traffic… they all eat away your day. Unfortunately, it’s the time you put aside for working out that often gets lost in the daily scramble called ‘life’. And while it’s hard enough just getting to the gym, we still haven’t even considered what it’s actually like in the gym. That’s a whole other element. You see, unless you workout at an obscure hour, chances are high that you’ll often be competing with someone else for a set of dumbbells, a bench, or any other piece of equipment. That can get really annoying in a hurry, especially since it minimizes your workout’s fat burning effectiveness. But let’s say you do manage to squeeze in time at the overcrowded gym, and you are able to round up all the equipment you need… if your workout doesn’t even make a dent in how you look or feel, then not only are you going to be frustrated and exhausted, but you’ll also have wasted your time. What you need instead is a workout you can do anywhere  one that not only gives you the flexibility to choose when and where to workout, but one that also maximizes fat loss and improves your conditioning. What you need is Turbulence Training Bodyweight Cardio 3. Inside my most popular ZERO-equipment program to date, you’ll find 4 challenging workouts, including my now infamous “5-Round Fat Burning Fight” workout that’ll leave you exhausted while sending your fat burning hormones into overdrive  even well after you’ve left the gym. Another reason to get these “anytime” workouts is because any one of them can be used to replace almost any other Turbulence Training interval workout I’ve ever created. And trust me, there will be days where you really don’t feel like jumping on the treadmill for a round of intervals. Now obviously, the more bodyweight-only workouts you have at your disposal, the more flexibility you’ll have when it comes to working out. And knowing that fat loss requires a consistent effort, it’s pretty much a no-brainer to get Bodyweight Cardio 3. But let us not forget, it was TT Bodyweight Cardio 1.0 and its “Crazy 8 Bodyweight 300” circuit that catapulted these no-equipment Turbulence Training workouts to preeminence. 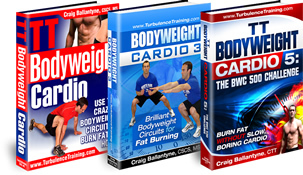 Now is your chance to not only see where it all began, but to see how these powerful bodyweight cardio workouts have grown to become one of the most trusted TT resources for getting and maintaining awesome results  and all while saving over 75% off the regular price. PS - If you want workouts you can do anytime, anywhere to get ripped  and all without slow boring cardio - then grab this offer today and SAVE over 75%. PPS - Your results are guaranteed by my 100% money back promise. If you aren't satisfied with your results from the program, just let us know and you'll be refunded your $19.95 before the end of the 60-day period.